It didn’t take Berwick long to rattle through Mordialloc on day two of their clash at Arch Brown Reserve in wintry conditions, but it may very well be the firestarter that the Bears needed. Crucially, the Bears all but sealed their spot in the four on Saturday, and effectively ended the season of the Bloodhounds and their chances of defending their premiership crown. The Bloodhounds resumed at 5/104, and in a healthy position to chase down the Bears’ 155 for victory and to draw level with the home side on points. With opener Brendan Morris set on 60, the Bloodhounds entered the day full of confidence. But that was quickly extinguished, with Brendan Rose (2/26) breaking through immediately, forcing the edge of Morris into the safe hands of keeper Nathan Pilon before he could even add to his overnight score, a game changing moment from a man signed to deliver these kinds of moments. Rose’s stunning start continued, with Liam Bence falling on the very next ball, also to the sure hands of Pilon behind the stumps. After the former Casey-South Melbourne star did the early damage, it was then Matt Chasemore (4/17) that delivered, with the skipper picking up the last three wickets cheaply to end the Bloodhounds on just 109, adding a mere five runs for the loss of five wickets in little over half an hour of play resuming to seal the win. The loss leaves the Bloodhounds with a lot of work to do and some results go their way, now sitting 12 points behind the Bears in fourth spot, while Chasemore’s group move one step closer to finally securing their spot ahead of a big clash against Hallam Kalora Park. 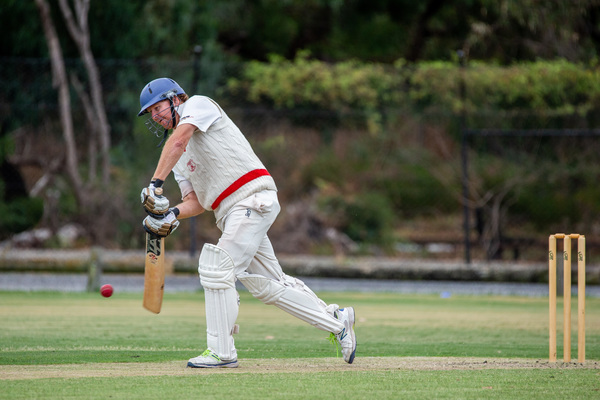 The great Steve Spoljaric, meanwhile, delivered yet another match winning performance with the bat, amassing 89 in Springvale South’s win against St Mary’s. 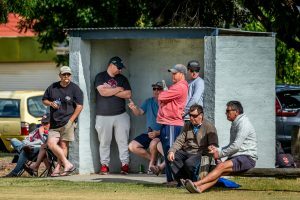 On a special day for the club, celebrating its 50 years as a cricket club, the Bloods surged to the top of the Turf 1 ladder, with plenty of past players and supporters settling in for an entertaining day watching them bat. Set a challenging 236 for victory, the Bloods got off to a fine start with openers Nathan King (60) and Michael Vandort (18) putting on 61 for the first wicket, but Spoljaric was the key, helping his side recover somewhat from 3/112 to chase the runs four wickets down. St Mary’s star Ruwantha Kellepotha sends one down. King in particular continued his electric form, sending another 11 balls to the fence, backing up his unbeaten century from the week prior to rattle past 500 runs for the season. But it was Spoljaric who once again shone, sending eight balls to the boundary and three sailing over the rope during his brilliant knock, while Jack Sketcher also provided valuable support with an unbeaten 40 to work his way into some handy form leading into finals. Spoljaric’s reign of dominance over the association just continues to grow, with the 41-year-old now almost crossing 6000 runs in the DDCA, and a remarkable sixth Wookey Medal in well within reach. Supporters cheer on the action at Springvale South on what was a special day for the club. Hallam Kalora Park’s hopes of taking out the minor premiership are well and truly alive after a stunning win over Buckley Ridges at Park Oval. The Hawks are just one point from second and six points from the top after holding their nerve to chase down the Bucks’ target. And they are certainly a side to keep an eye on, and crucially, seem to be peaking at just the right time of the season. 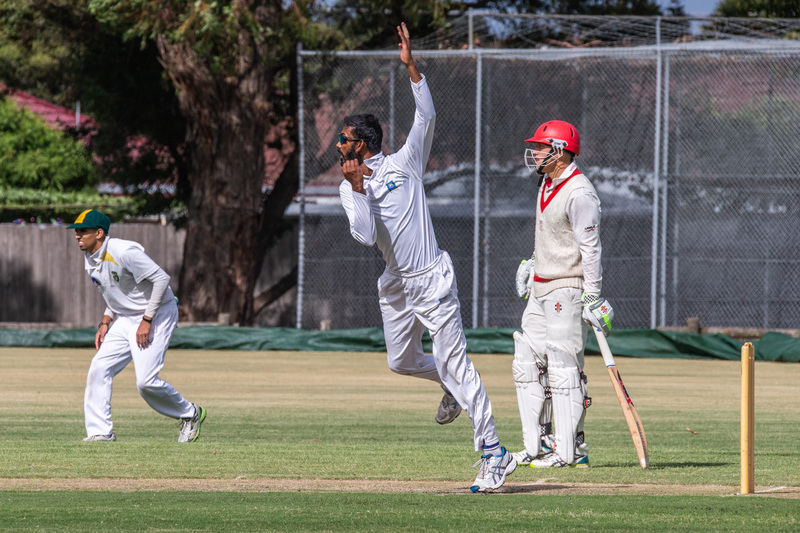 Resuming at 1/79, still needing 103 runs for victory against the home side, Ben Hillard (67 off 217 balls) and Jagveer Hayer (40 off 111) kept their composure, nudging the Hawks to 148 before Hayer’s dismissal. Hillard’s grit and determination to not just give up his wicket was evident, chewing up almost five hours of batting to grind the Bucks into the ground without one of its premier quicks, Daniel Watson. Despite losing a couple more wickets in quick succession, the Hawks scrapped over the line with six wickets to spare in a crucial win for the club. With seamer Jurgen Andersen finally making his return from a nasty injury picked up just before Christmas, the Bucks kept things tidy, but just couldn’t find the breakthrough when needed, with medium pace Susa Pradeep (2/42) the only to take multiple wickets. In the final game of the round, Heinz Southern Districts drew with North Dandenong at Reedy Reserve. Needing 213 for victory after a sparkling day one century to Cobras champion Michael Davies, the Maroons were in a spot of bother early, falling to 4/44 after Suraj Randiv (5/62) injected his class onto the contest. Skipper Asfan Thajudeen (47) and Syed Mehmood (40) fought extremely hard to wrestle back the momentum, and their patience and grit paid dividends, with weather intervening with the home side needing just a further two wickets to win.